0 Comments Published by Cedric Benetti on Monday, October 29, 2007 at 10/29/2007 06:24:00 PM. The NYT built its headquarters on 42nd Street in 1904, giving its name to Times Square. It was here that the New Year's Eve tradition of lowering a lighted ball from the Times building was started by the paper. After only nine years in Times Square, the paper relocated to 229 West 43rd Street. It remained there until the spring of 2007, and is now three blocks south, at 620 Eighth Avenue. The original Times Square building, now known as One Times Square, was sold in 1961. Because of the extensive cost of renovating the building with central air conditioning, the building currently has no tenants and is only used to hold dozens of colorful advertisements. Additionally, the operators of One Times Square have noted that the building makes more revenue as a collection of advertisements than it would full of tenants. 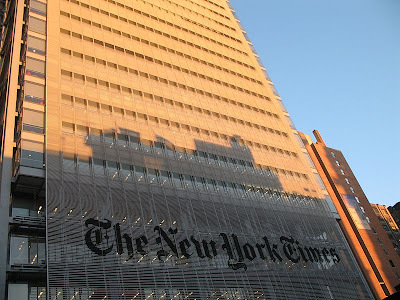 The new Times headquarters are situated in the New York Times Building skyscraper designed by Renzo Piano, which opened in June 2007 at 620 Eighth Avenue, between West 40th and 41st Streets. The building is currently tied with the Chrysler as second tallest building in NY and 6th tallest in the US.